Their record isn’t anything to crow about; a 15-16 mark isn’t going to get anyone dreaming about the postseason, as it’s still sub-.500 roughly 20 percent into the season. 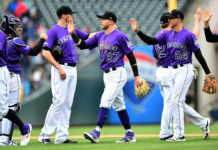 But simply focusing on the pure wins and losses would be missing the point; for those paying attention, there is plenty to be encouraged by when it comes to this year’s Rockies. And this weekend’s series at San Francisco – a four-game set that saw Colorado split with their division rival – was a microcosm of the season. While the end result might not have been dazzling when it came to the standings, a deeper look shows that things are trending in a positive direction. As is typically the case with the Rockies, it all comes down to pitching. And given that they were facing a team that trots ace after ace after ace to the mound, it was impossible to not be encouraged by the fact that Colorado matched San Francisco pitch for pitch across the weekend. 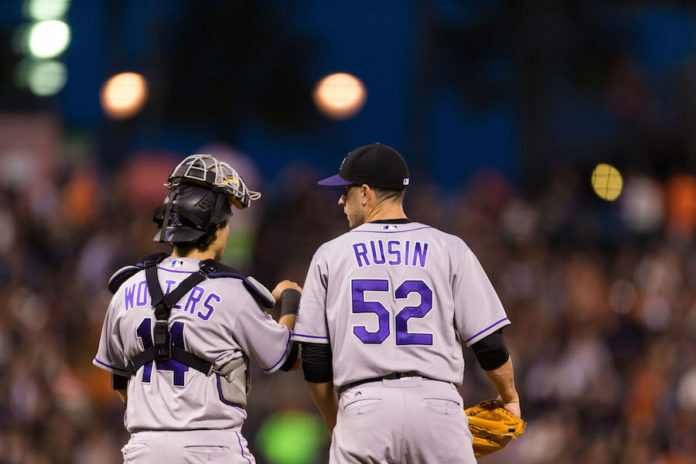 In the series opener, Chris Rusin’s stat line was ugly, as the hurler failed to make it through the fifth inning before being yanked after surrendering seven earned runs. But that number is skewed by the fact that he spent more than a half hour in the dugout between innings, as the Rockies put 13 runs on the board in the top of the frame. The part-time starter certainly kept his team in the game early, setting the stage for the monster inning. The next night, Colorado got to former World Series hero Madison Bumgarner early, putting four runs on the board in the second. But they were unable to hold the lead, as Chad Bettis surrendered five runs across six innings. The loss dropped his record to 3-2 and inflated his ERA to 4.40, two stats that don’t quite measure the pitcher’s improvement. 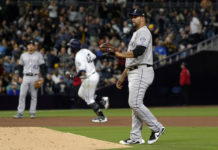 Perhaps more telling is that the outing marked the sixth straight start in which Bettis went at least six innings; given the Rockies’ penchant for burning through their bullpen, that’s a number that can’t be ignored. On Saturday, another loss came Colorado’s way, as they fell 2-1 in 13 innings. But again, it wasn’t the end result that mattered most; instead, it was the performance by Jon Gray, the team’s supposed ace-in-training, that should be remembered from that day. In seven innings of work, he allowed just one hit and kept San Francisco off the scoreboard, putting on a dominant performance that was by far the best of his young career. While the hard luck pitcher failed to get a win for his efforts, the game showed that there could be many more gems to come from the 24-year-old. 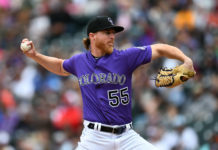 And yesterday, Colorado salvaged a split by blanking the Giants 2-0; it was the rare instance when the Rockies managed to be involved in a pitcher’s duel, coming out on top after a strong outing from Eddie Butler. On the day, the once-promising prospect looked like the up-and-coming ace that he was once projected to be, scattering four hits across six innings to keep San Francisco at bay; he was in total command, avoiding any serious trouble throughout the day. In four days, the Rockies went up against a team that ran Matt Cain, Bumgarner, Johnny Cueto and Jeff Samardzija to the hill; and at the same time, their top hurler so far this season – Tyler Chatwood – wasn’t up in the rotation. In the past, that would have spelled disaster; that scenario would’ve been tailor made for a weekend in which Colorado was woefully prepared to compete. But this time around, that was anything but the case. Instead, the Rockies matched the Giants pitch for pitch; in four games, the home team didn’t appear to have a pitching advantage at any point. And that’s remarkably encouraging. Yes, it would’ve been nice if Colorado hadn’t squandered a one-run lead in extra innings on Saturday. Sure, splitting the series can feel like a little bit of a letdown, especially since both losses could’ve easily been victories. But that’s failing to see the positives. The Rockies just completed a 10-game road trip in which they went 6-4, improving their road record to 11-8 on the season. As a result, they sit only one game back in the NL West, a division that no team seems primed to run away with thus far. And they’re in that position because they’re consistently getting solid performances from their starting pitchers. This weekend proved the point. On paper, San Francisco had the pitching advantage every game; but on the field, Colorado’s starter was every bit as impressive. If that can continue, good things are on the horizon. The way the Rockies young pitchers are performing, 2016 might not be another long, lost season.